At 21, Cuesta College fashion design student Melanie Berry decided to drop out. Not because she was discouraged, but because her fashion design classes were getting in the way of her fashion career. MODEL AND MAKER: Fashion designer Melanie Berry in clothing she designed herself. Almost three years on, Berry is virtually the only successful fashion designer on the Central Coast. A search for any others—online and in the concrete world—yielded nothing. Berry herself couldn’t think of another successful fashion designer who lives in San Luis Obispo. Instead of just talking smack, Berry cultivated a look of her own. She enrolled in a pattern-making course at Cuesta College and began to create her own modest, vibrant, vintage-inspired threads. Some she sported herself, but others she sold at local consignment shop California Blonde. On one fortuitously timed shoe-shopping excursion to Therapy, a Higuera Street boutique, Berry was “discovered” by the store’s owner, Jing Chen, who complimented her on the handmade clothing she wore. Berry showed her 12 more of her classy, 100% cotton pieces, and Chen was quick to place an order to sell at her Therapy stores in the Bay Area. BEAUTY AND BRAINS : A model in one of Berry’s designs turns to literature. 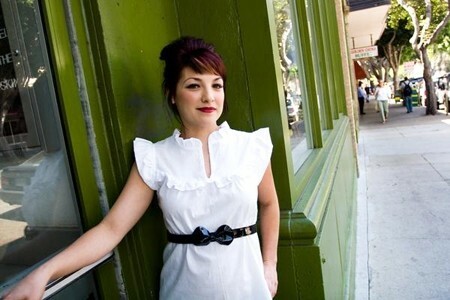 Thus Berry’s women’s clothing label, Melanie Renee Design, was born. With her teachers’ blessing, Berry quit her design classes to care for her newborn label. She has since moved from the cozy office she once rented, a workspace that teemed with beautiful things in the making, so colorful it was almost alive. Working out of her home office now, Berry makes the initial sketches, creates her patterns, and sews sample pieces. Though she uses only original patterns, her inspiration comes from vintage clothing, magazines, and the street. Her clothing “captures who she is—bright and bubbly,” remarks Joshua Caine, frequent collaborator and full-time friend. ON THE STREET: ‘Tilly’ top by Melanie Renee. Today, Berry’s wearable, urban dresses and blouses can be found in shops as distant as Japan and as conveniently proximal as downtown SLO. Many designers of the same age and success level would be absorbed into the larger fashion and art scenes of San Francisco or Los Angeles. But that isn’t what Berry’s about. “Accessible,” after all, is her label’s key word. Her handmade clothes may travel to Los Angeles, Portland, or Orlando. Berry, an SLO native, is sticking to her roots. She wants to establish Melanie Renee as a San Luis brand and aspires to create a “fashion network” on the Central Coast. Being one of the only known fashion designers in the county, this sounds a bit daunting, not to mention lonely. But Berry has many valuable friendships. In addition to Caine, Berry also teams up with Reveal Salon, even having a trunk show there. She intends to use this talent pool as a base for a larger network of SLO independent artists and designers in the future. Locally made fashions by Melanie Renee Design can be found at Therapy in San Luis Obispo and at Rouge in Pismo Beach. Though the designer does not take individual orders, her work can be seen at Myspace.com/melaniereneedesign. Intern Anna Weltner doesn’t always say no to crack. Send her fashion advice via arts editor Ashley Schwellenbach at aschwellenbach@newtimesslo.com.